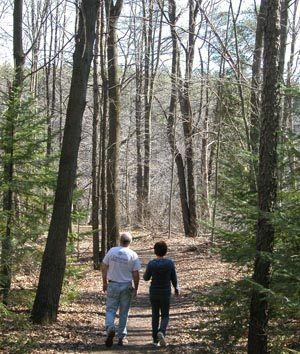 An ice age 25,000 years ago and some unsuccessful farmers in the 1930s resulted in an undeveloped tract in Livingston County where today you can go for a 5-mile walk in the woods to escape the concrete and crowds of Southeast Michigan. 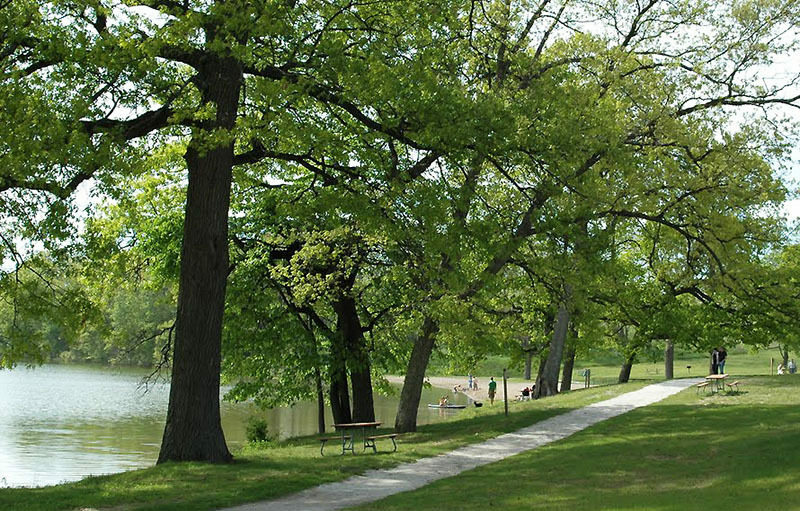 The glaciers of the Pleistocene epoch were responsible for Brighton Recreation Area’s rolling topography of moraines and ridges, steep-sided kettles, and numerous lakes and ponds. As towns such as Brighton and Howell grew in the 1800s, woodlands were cleared, and farms developed but were never very productive. It was a challenge to make a living by plowing land characterized by glacial drift and wetlands. During the depression of the 1930s, it became impossible, and farmers began selling out or, in many cases, simply abandoning their property with the state purchasing much of the park between 1944 and 1949. Penosha is the Chippewa word for long and for most people this 5-mile trail is just that, a two-and-half to three-hour hike through a hardwood forest of maple, hickory, and oak. Despite all the lakes within the park, the scenery along this walk does not include any of them and is not overly spectacular. But the land is interesting and the trees impressive, and together they provide for a pleasant afternoon in the forest walk with only a few man-made intrusions in view. That includes mountain bikers. Since the late 1990s, they have had their own trail system at Brighton Recreation Area and are prohibited from Penosha. The trail is well marked by posts with blue dots and maps at all major junctions, making it easy to follow. There are no lakes along the route but there are numerous ponds and small marshes, making it buggy at times in late June and early July. The best time to hike is spring and fall. By early April the snow is gone and wildflowers begin to emerge and by May morel mushroom hunters can be seen poking the ground with long sticks. In the fall leaves begin turning between late September and early October, peaking at the end of that month and lingering on well into November. The trail receives its heaviest use during that period, but even on a bright and crisp weekend, you'll see only a handful of other hikers. Across from the park headquarters, Bishop Lake Road heads east to wind pass Bishop Lake Campground and then 1.1 miles from Chilson Road reaches the day-use area. 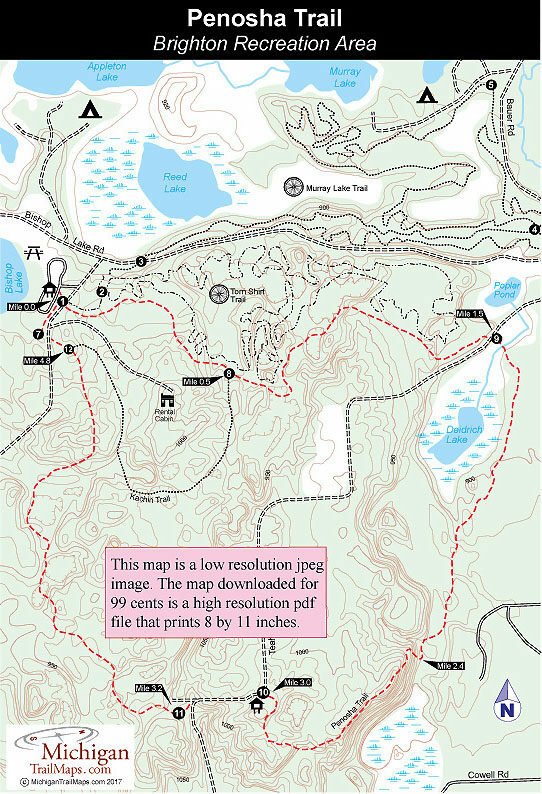 On the east side of the large parking area is a large display area and map that serves as the trailhead for both the hiking and mountain biking trails. Penosha is a loop that is numbered in a clockwise direction. You share the trail with mountain bikers for only a few yards as you quickly reach post No. 1 where they head left and you head right. A few more yards post No. 7 arrives where the Penosha Trail splits. Head east (right) and you’ll immediately cross Rolison Trail, the dirt road that heads south to the group campground and rental cabins. You cross the road and within 100 yards of the trailhead you have escape into the woods, following a wide path in a rolling topography of predominantly oaks. The trail is marked by blue and yellow dots as you are also following the Kahchin Trail. After the first good climb of the day, you bottom out on the other side at the post No. 8 a half mile from the start, the junction where Kahchin Trail splits to the south. Just beyond the post Penosha Trail passes what appears to be a long row of boulders. This is the most visible stone fence remaining from the old farms. The fences not only represented property boundaries between farms but were usually convenient places to stack boulders left by the glaciers and removed by the farmers while plowing their fields. The terrain becomes more hilly and 0.8 mile from the start the trail skirts a series of kettles, wooded hollows created by the glacial activity. Some are dry at the bottom, others are marshy and good places to look for wildlife. At Mile 1.2 you top off on a ridgeline. An old two-track once headed south along it to a viewing point but is nearly impossible to find now. Penosha Trail continues east, passing through more regenerating fields, semi-open forests with large maples and hickory trees, and kettles on both sides of the path. Eventually, you parallel Teahen Road from above, finally descending to the dirt road via a staircase. On the other side of the road is post No. 9, reached at Mile 1.5. You immediately cross a creek that is unbridged and can be muddy in the spring and pass a unmarked junction. Keep right to enter a more mature forest, and soon you’re wondering if you’ll spot Deidrich Lake. You won’t. You come close to the east side of the small marshy lake, but the forest is thick here and the leaves prevent you from spotting it most of the year. For the next mile, the hike remains in the forest and becomes a stroll along the hilly terrain. At one point, you skirt the base of a steep slope. Then at Mile 2.4 the trail makes a 180-degree turn and ascends to the top of the heavily forested ridge for the most interesting stretch of the day. You steadily climb for a quarter mile and pass the first home of the day before topping off at 1,035 feet in a grassy field. You return to wooded hills and make a final climb topping off at a grassy knoll where you can peer down into the surrounding forest. On a clear October afternoon this is a beautiful place to take a break. Within a few steps, or at Mile 3, you arrive at post No. 10, marking a small parking area off Teahen Road. Blue dot posts direct you to head left down Teahen Road. Within a quarter mile a “Hiking Trail” sign directs you to cross a gravel driveway to post No. 11, where you return to a foot path. You immediately climb a small hill pass a home and then follow a fence row pass the backsides of some rather impressive houses. But within a quarter mile of Teahen Road you’re back in the woods and away from any signs of civilization. At Mile 3.8 you make a long descent that bottoms out between two marshy ponds, the one on the left the largest of the day and filled with croaking of spring peppers in April and May. A long climb follows and tops off with you skirting a large meadow from above and then a smaller one. At Mile 4.75 you reach post No. 12 where the Kahchin Trail returns and then immediately re-cross Rolison Trail. The trailhead and day-use parking area are only a couple hundred yards away.